Here's an old Hollywood photo gallery of classic movie stars on the tennis court. The above photo shows tennis lover Jean Harlow goofing around with her racquet. Keeping in shape was a top priority for Old Hollywood movie stars, who were required to look their glamorous best both on and off the silver screen. 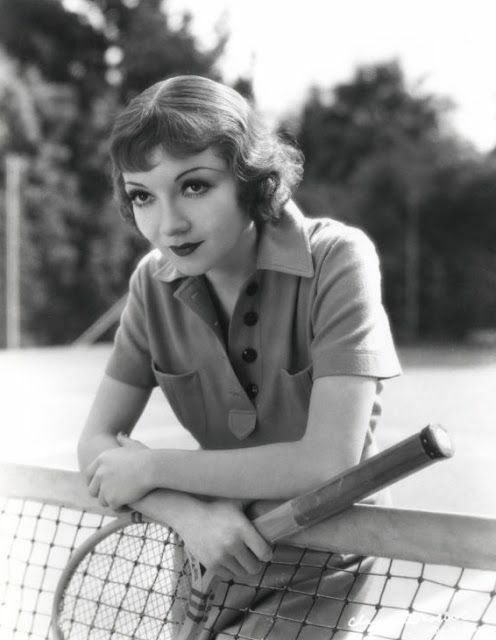 During the 1930s and 1940s many stars kept fit by picking up a tennis racquet and heading out to their country club or to their own backyard tennis court for a vigorous match. 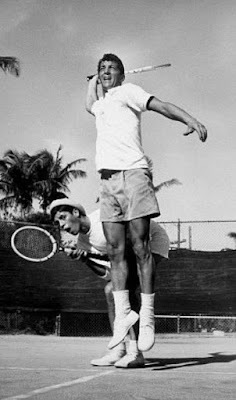 With that in mind, here's a photo of gallery of some old Hollywood favorites playing tennis. Harlow photographed by Clarence Sinclair Bull in 1934 at the Pacific Coast Country Club. Harlow's flowing and formal outfit was quite typical of what female tennis pros like Helen Wills Moody wore during the era (photo source: IMDB). 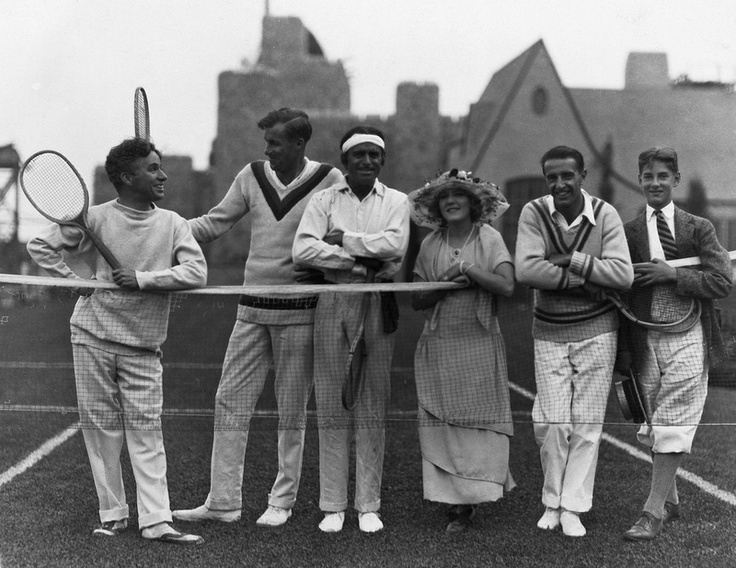 Hollywood stars first became fascinated with tennis during the 1920s when American Bill Tilden became an international celebrity by winning Wimbledon twice and the U.S. Open seven times. Tilden eventually made it to Hollywood, where he worked as a tennis coach and even appeared in silent films. The photo above shows Tilden (second from left) with Charlie Chaplin; Douglas Fairbanks; Mary Pickford; tennis pro Manuel Alonso, and Tilden's protege Alexander Wiener (photo source: Getty Images). Tilden (at left) also coached Judy Garland and Paulette Goddard. They are at a celebrity charity tournament here (photo source: Pinterest). 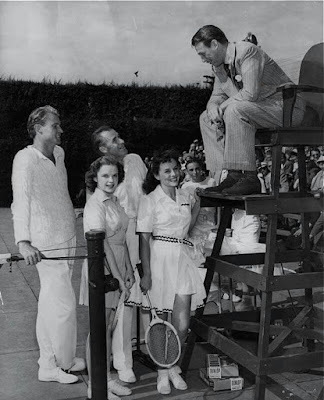 Tennis was so popular in the 1930s that virtually every Hollywood star did at least one photo shoot with a tennis racquet in his or her hand. Sometimes they were actually playing like this photo of the ever graceful Fred Astaire. . .(photo source: Pinterest). . . .Or just simply posing with a racquet like Claudette Colbert (photo source: Cosmosonic Tumblr). 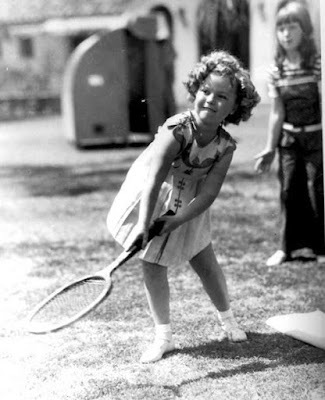 Even child star Shirley Temple got in the act by taking up the kid friendly sport of badminton (photo source: Pinterest). 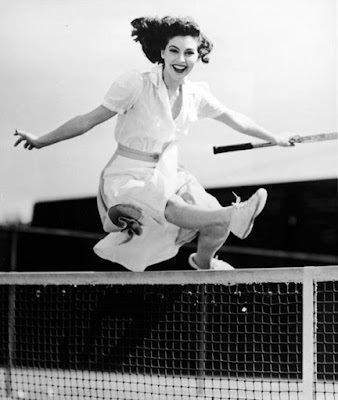 Avid tennis player Ava Gardner jumps the net in this 1940 photo. 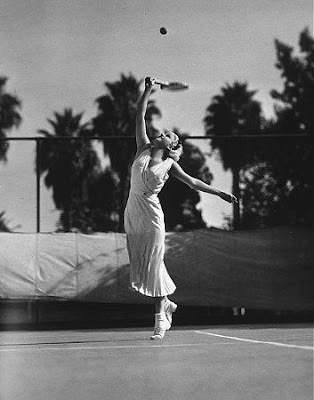 The athletic Gardner played tennis every day, and the MGM publicity department never missed an opportunity to release glamorous publicity stills of the actress cavorting around the court or posing for publicity stills in designer outfits (photo source: Getty Images). 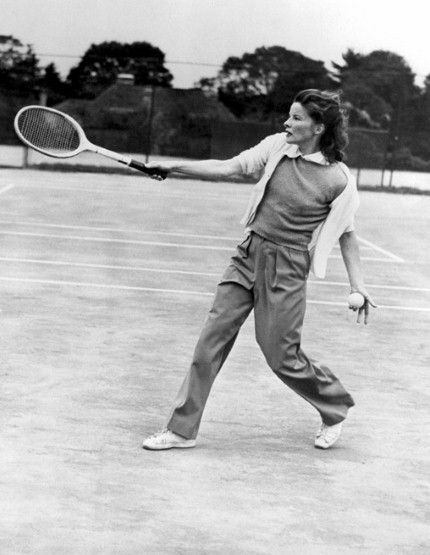 While other stars got dolled up in designer gear before hitting the court, serious tennis player Katharine Hepburn -- she often said she wanted to come back in another life as a tennis champion -- prefers the practical look while playing at Philadelphia's Merion Cricket Club in 1940 (photo source: The Telegraph). The title for old Hollywood's best tennis player goes to swashbuckling star Errol Flynn. 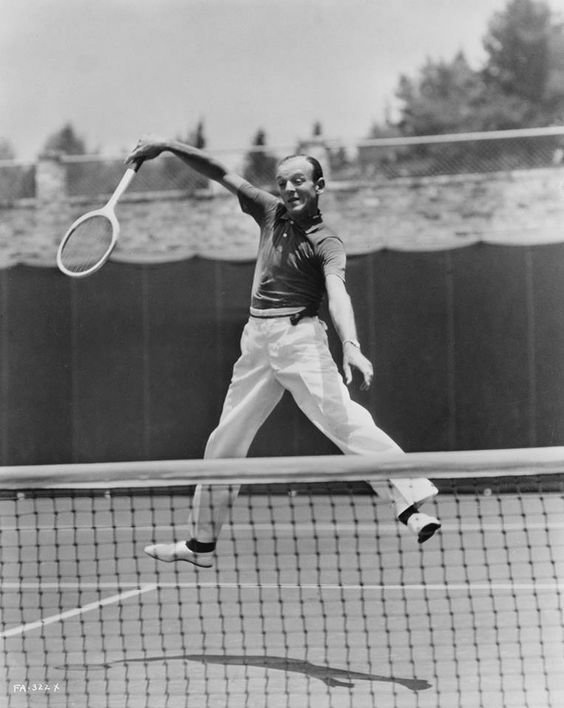 The Australian actor often played in and won amateur tennis tournaments around Hollywood. 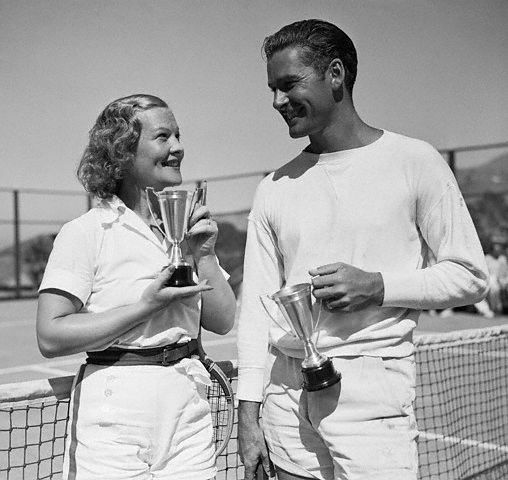 Here's he and Irene Biller holding their mixed doubles trophy in 1937 (photo source: Getty Images). Another shot of Flynn in action. 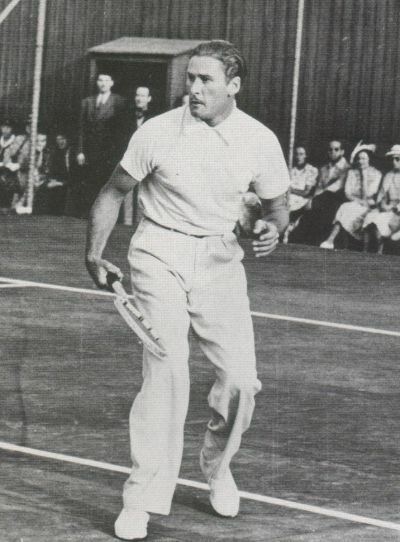 The star and Wimbledon champion Sidney Wood actually qualified to play doubles at the U.S. Open, but they never appeared in the tournament. You can read more here. (photo source: Errol Flynn Blog). Comic duo Jerry Lewis and Dean Martin play "doubles." (photo source: IMDB).